Update November 2012: Patty & Bun have launched a permanent restaurant on James St. behind selfridges, and it's glorious. 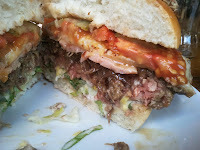 Read the full Patty & Bun restaurant review. 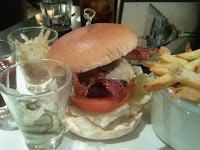 Update May 2012: Patty & Bun are now popping up at The Endurance on Berwick Street, Soho. Tucked away in a warehouse, just off Battersea Bridge Road is a place called The Doodle Bar. It's a wicked space, populated with beautiful, beautiful people (slightly more adventurous sloaney types who've made it across the river), art installations, a table tennis table, a bar, and a kitchen that on a Friday night is taken over by Street Kitchen (@streetkitchen) (a venture headed up be Mark Jankel, serving cracking lunches to the well-heeled in Broadgate) and Patty & Bun, a concept by the effervescent Joe (@pattyandbunjoe). Out for a swift Thursday lunch with my old boss, we decided to meet and eat in a location equidistant from our offices, in the Old Jewry outpost of Browns, a chain of 20 or so Brasserie-styled restaurants situated across the UK. I hadn't yet had the pleasure (or as you'll find out later, the displeasure) of the Browns burger, so thought I'd kill two birds with one stone by catching up with an old friend, and running the Burger Me! treatment over the hamburger. "I have ataraxia*. It's a condition categorised by freedom from worry." I thought I'd add that quote from Lucky Number Slevin to kick this review off. If truth be told, I was mildly worried about whether Lucky7, an east coast-styled burger and hard shake joint tucked out of the way in the heart of residential Westbourne Park, was going to be anything other than mediocre. Pre-conceptions are a terrible thing. The Wenlock & Essex is located on Essex Road, Islington just a few minutes walk from Angel tube station. It's a quirky, circus-themed pub (and I mean design rather than contortionists and lion tamers - more's the pity) and covers an enormous low-ceiling'd ground floor area, with space for up to 250 covers. After attending the recent Advance preview of The Diner's Grab burger, where I'd been reacquainted with old friends, and met even more burger lovers, I got speaking to James Morgan, the Wenlock's young and energetic head chef (follow him on Twitter: @headchefwenlock) who invited a group of us to join him at the Wenlock & Essex to sample a burger here was really rather proud of, as well as previewing a couple items being developed for a new look dining menu coming in April. Alex (@eatingsoho), Sam (@steampie), Claire and Steve all joined the party.